QUANAH, TX (TNN) - Two fires broke out at a auto repair shop in Quanah Friday. The first led to an explosion in that killed a man, according to Hardeman County Sheriff Office. 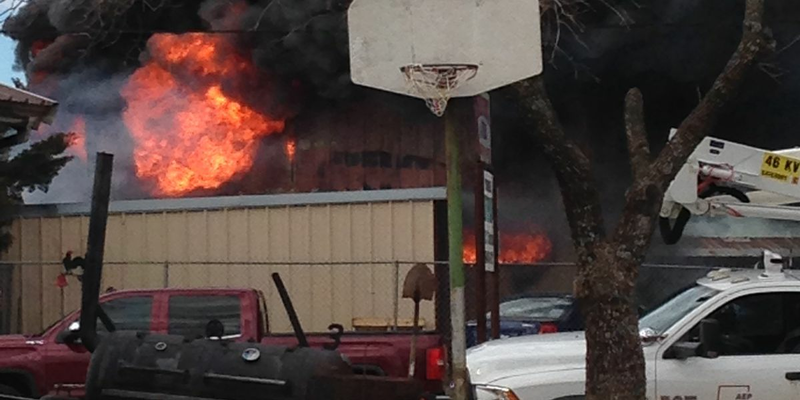 Sheriff Pat Laughery said they got a call around 11:30 about an explosion that broke out at Isnhower Auto Repair. Crews from Quanah Fire Department, Chillicothe FD, and Crowell’s FD responded to the fire. Three people were at the shop when the fire broke out, two outside and one inside. The man inside died, while the other two have been taken to the hospital. Both are at UMC Lubbock. Officials confirmed that Robert Floyd Pierce, 69, died as a result. He was a retired firefighter from the Vernon Fire Department. UMC Lubbock has released the name of the other two burn victims. They are brothers Gerald and Robert Isnhower. Hospital officials say they are in critical condition as of Friday night and are being treated in the burn unit. Sheriff Laughery said it is a tragedy and they give their prayers to the family. Three Fire Marshalls on investigated the scene Friday afternoon but have not determined the cause of the explosion. Another, smaller fire broke out inside the shop around 7:30 pm while News Channel 6 was still at the scene. First responders arrived and put out the fire. Both a DPS trooper and a Hardeman Sheriff’s Deputy are monitoring the shop in case another fire starts. The cause of the second fire is also unknown. One customer, Chris Canales, stopped by in the afternoon to see what had happened to the shop. He could not believe how much it had changed from that morning when he first dropped off his pick-up truck. He remember having a conversation with Gerald Isnhower and the now deceased Robert Floyd Pierce. Caneles remembers Pierce talking about his grandchildren. Canales also said that same morning Gerald Isnhower gave him a ride home. Canales was shocked to later find out what had happened at the shop.